San Joaquin UC Master Gardeners - Learn more about growing your own produce! Sign up to receive announcements, tips and newsletters from the MFP program. Strawberry Heaven - Lets make jam! Strawberry Heaven! Let's make jam! It's strawberry season! Join us and learn how you can preserve strawberries while they are in abundance locally. We will make strawberry jam and process it three different ways. Participants will take home three jars of jam; a freezer jam, a jar processed in a water bath canner and one processed in a steam canner. Cost is $25.00. Register ASAP, seats are limited! Questions, please call 209-953-6100. Classes are held at the Cabral Agricultural Center, 2101 E. Earhart Ave, Stockton, 95206. 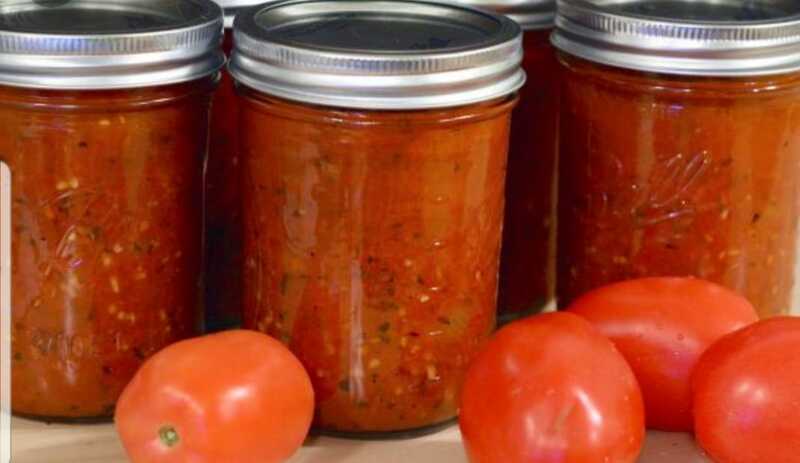 REPEAT class, this Tuesday (April 16) on Growing Terrific Tomatoes and Making Salsas and Preserving Tomato Products. 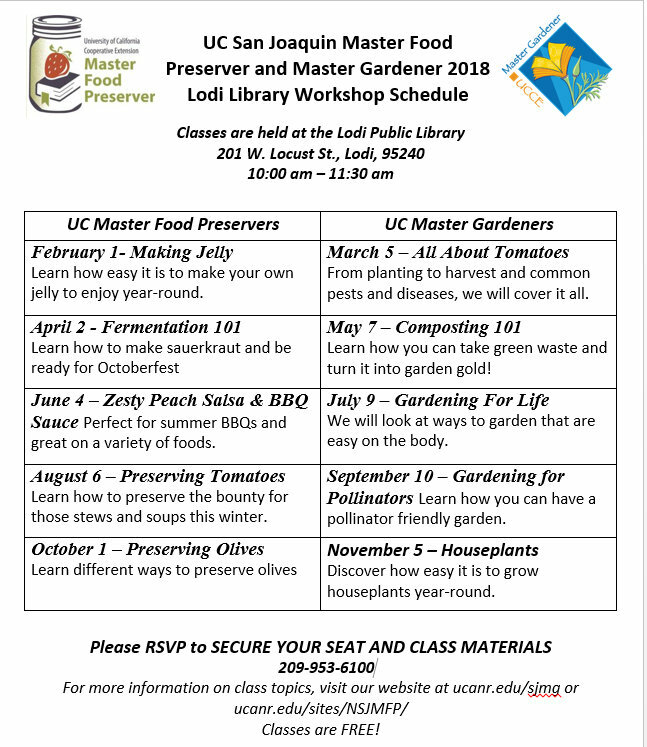 This free class is taught jointly by the certified UCCE Master Gardeners and Master Food Preservers. Please call 209-953-6100 to reserve your seat and handouts. 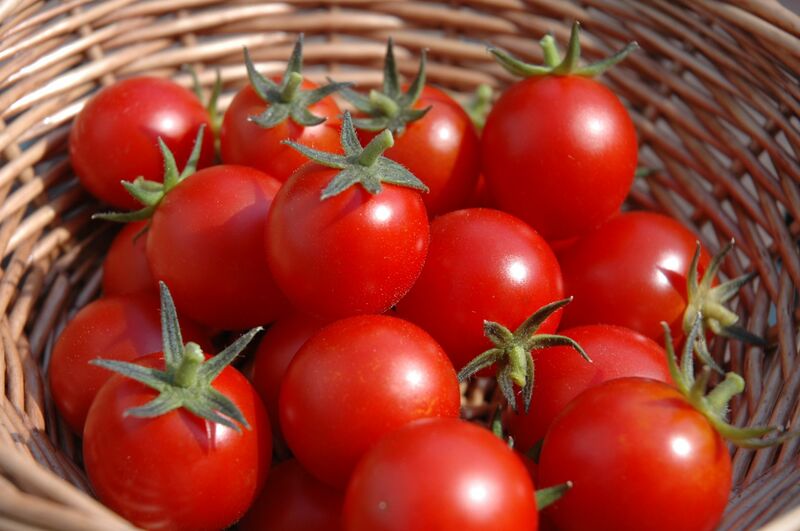 The Master Gardeners will be sharing methods and tips for a successful tomato harvest. 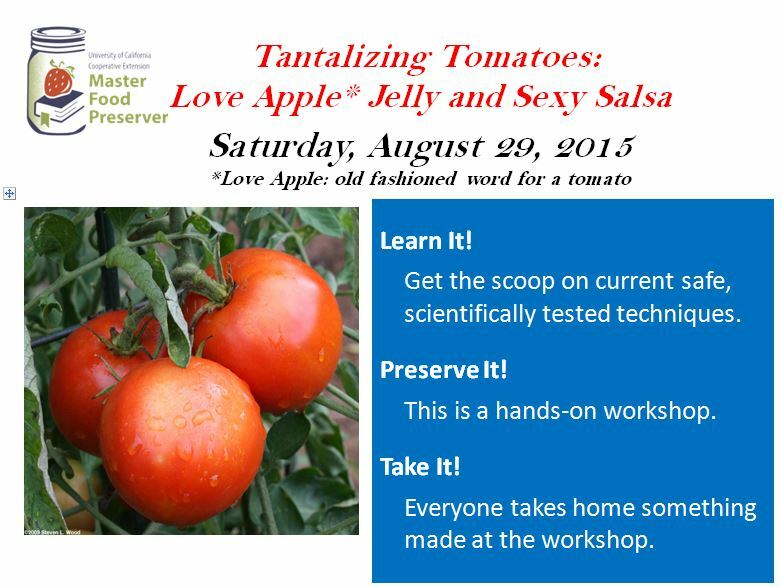 The Master Food Preservers will be sharing salsa making and the different methods of preserving tomatoes. Please call 209-953-6100 to reserve your seat and handouts. Registration is now open for our March workshop on Fermentation! Our hands-on workshop will teach the basic principles of fermentation that will give you the confidence to try new recipes at home. You will be making Kimchi and Sauerkraut to take with you and we will demo how to prepare your own Kombucha starter. Register here. Space is limited! Classes are held at the Robert J. Cabral Agricultural Center, 2101 E. Earhart Ave., Stockton, CA 95206 in the Calaveras Room. If you need assistance or accommodations, please contact the UCCE Master Food Preservers of San Joaquin County at 209-953-6100. There are still a few seats left for this Saturday's class. Don't miss out!! 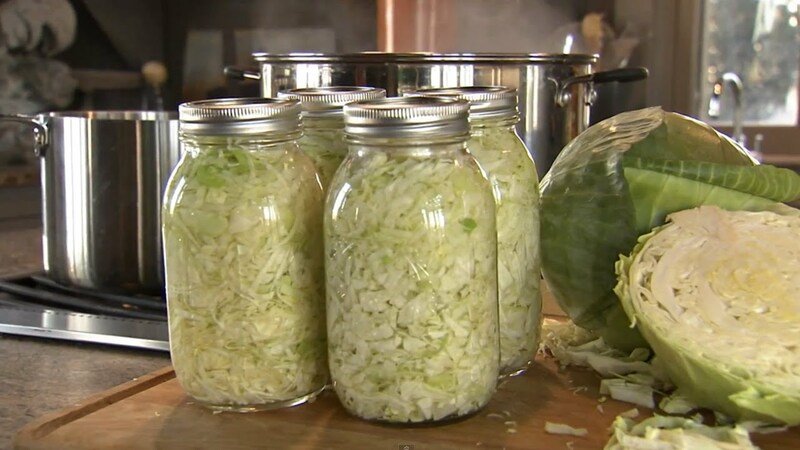 Learn why pressure canning is the most important aspect of home food preservation, food safety, how to properly utilize a pressure canner and more in this ‘make and take’ class. Pressure canning opens up a world of canning broth, soups, meats, and vegetables that you can use throughout the year. In this workshop, we will make a stock and beans that you will get to take home and enjoy. Bring an apron and wear comfortable shoes. Questions? Please call 209-953-6100. If life gives you an abundance of lemons this season, then come to the San Joaquin UC Master Food Preserver hands-on workshop to learn how you can preserve them. 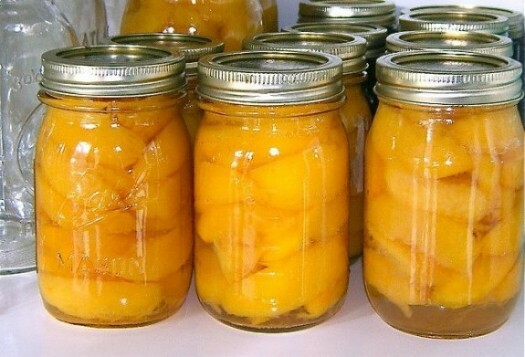 You will make two jars of product: one jar of lemon ginger marmalade and one jar of salt preserved lemons. In addition this workshop will be an opportunity to learn atmospheric steam canning which is faster and easier than the traditional water bath canning. We hope you have a great winter of home food preserving and remember: Preserve Today and Relish Tomorrow! Join us for our last San Joaquin Master Food Preserver Workshop for 2018! When it comes to gifts, nothing beats homemade. Be prepared for this holiday season by attending Gifts from the Kitchen. You will learn how to make FOUR simple preservation items as well as techniques to make your gift look special. This is a longer workshop and also a larger workshop. Come prepared to have fun, meet some new preserver friends and take home four samples of items you can easily make at home. You will make and take 3 jars of each: Pickled Pumpkin, Lemon Curd, Octoberfest Beer Mustard and Herb Infused Oils and will go home with inspiration to create handcrafted gifts in your kitchen for family and friends. We have 2 events left for 2018. Sign up today! Spaces are limited. How do you like your Olives! Do you have an olive tree and all it does is make a mess because you don't know what to do with the little fruit? Are you interested in planting an olive tree and having your own supply of olives for friends and family. Come to this DEMONSTRATION and learn the ways to process and prepare olives for consumption. It's a demonstration you won't want to miss! Check in begins at 9:30 am. Class begins at 10 am sharp. Classes are held at te Robert J Cabral Agricultural Center in Stockton. Sign up for our September pickling class! 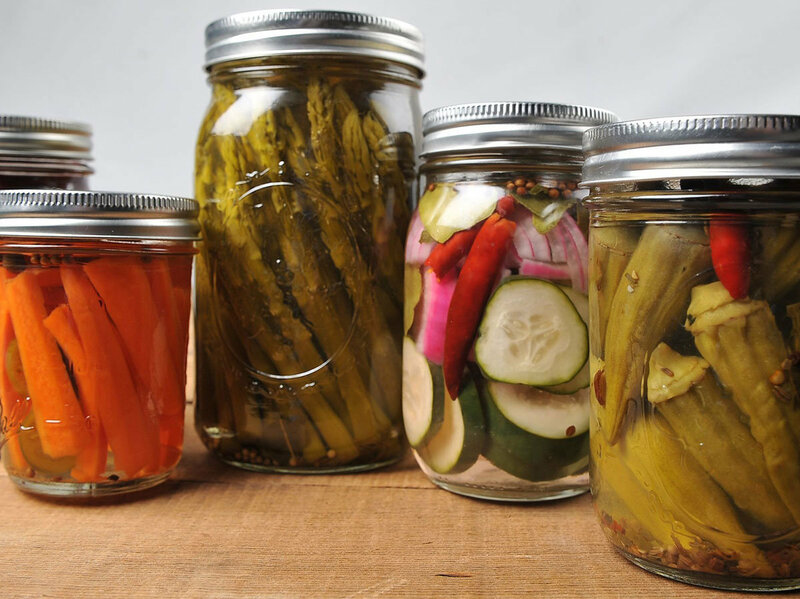 It's time to register for our September pickling workshop! Please note, there will not be an August class. Our Farmers Markets are loaded with cucumbers perfect for pickling - dill, sweet, bread and butter, or refrigerator, but cucumbers aren't the only vegetable or fruit you can pickle. Attending this workshop will teach you the pickling basics you can apply to your garden favorites. Bring an apron and be ready for this hands on class. Check in begins at 9:30 am. Class begins at 10 am sharp and ends at 2 pm. .
$25.00 Click here to register. If you need assistance or accommodations, please contact the UCCE Master Food Preservers of San Joaquin Valley at 209-953-6100. Do you want to learn more about safe home food preservation and get involved in your community? The August 11th application deadline is quickly approaching for our 2018 Master Food Preserver Training! There will be 2 orientation meetings at the Ag Center (2101 E. Earhart Ave, Stockton,95206). The first one will be on Tuesday, August 7th at 6 pm and the second one will be on Saturday, August 11 at 9 am. Please call in to 209-953-6100 reserve your seat at one of these required meetings. We are excited to start our training in September and can't wait to meet all of our new volunteers! For more information and to download our application, please visit our website by clicking here. July Peach Workshop Register Today! There is still time and room to sign up for our July 21st hands-on workshop! 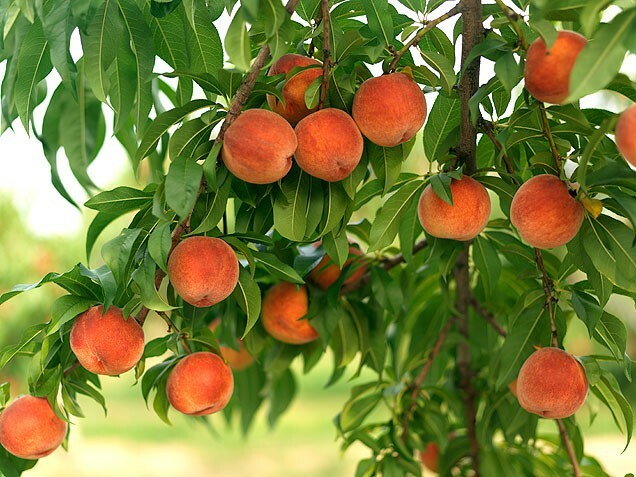 Delicious, beautiful peaches are beginning to flood into the markets. It is time to put up your peaches to use in the future. Basic water bath canning technique will be taught in class to preserve the products of the day. This workshop will provide products to take home from this hands on class. Bring an apron, wear closed toed shoes and be ready for this informative fun class. Cost of class: $25.00 (includes morning snack and lunch). If you need assistance or accommodations, please contact the UCCE Master Food Preservers of the Northern San Joaquin Valley at 209-953-6100. 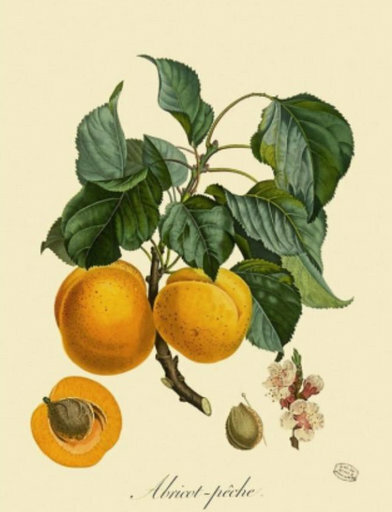 Summer is here and we are excited to share our newest edition of Preservation Notes, full of great info on preserving the bounty of summers harvest. This is one of the best times of the year for preservers, first timers and experienced. Summer in the central valley gives us a plethora of fruit and vegetables with which to work preservation magic. We have covered several different methods of preserving in this issue as well as some summer food safety reminders. We hope you enjoy this issue! Happy Preserving! We Are Now Accepting Applications! Application deadline is August 11, training begins September 11th! Jams and Jellies is the most basic of boiling water bath food preserving. Most times its fruit sugar and pectin. Have you ever made them sugar free or low sugar? Have you ever made them pectin free? Does liquid make a difference than powder? Come learn the advanced methods of jams and jellies. This workshop will provide product to take home. Do you have a tree that gives you an abundance of fruit? Did you buy too much at the Farmers Market and you are wondering what to do with all that fruit? Make jam (or jelly)!! Making jams and jellies is the most basic of boiling water bath food preserving. Most times its fruit sugar and pectin. Have you ever made them sugar free or low sugar? Have you ever made them pectin free? Does liquid make a difference than powder? Come learn the advanced methods of jams and jellies. This workshop will provide product to take home. May workshop Spaces still available for this Saturday! Spaces still available! Sign up today! 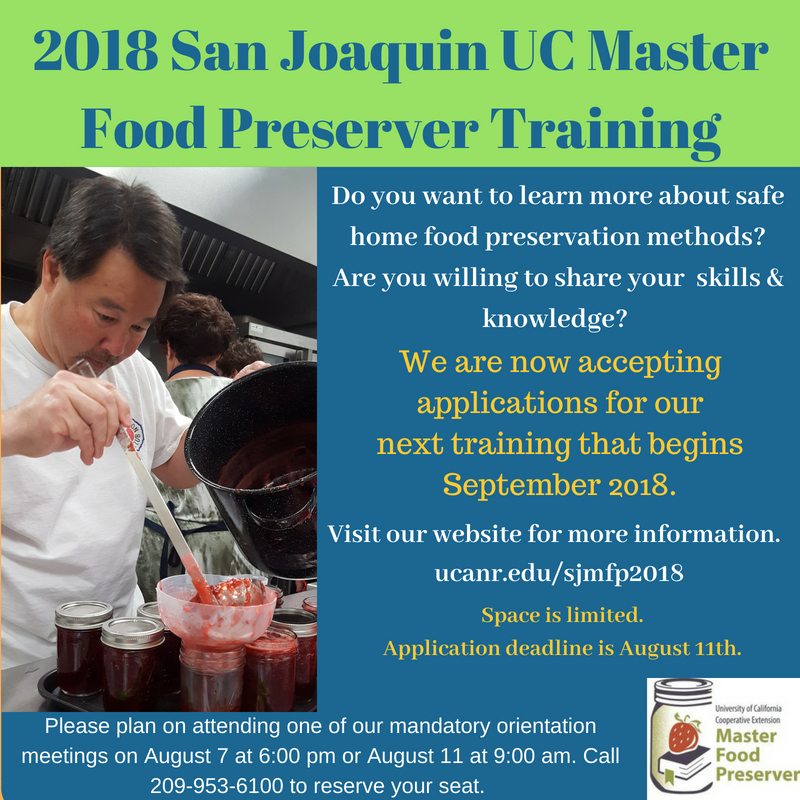 The UC Master Food Preserver Program is now accepting applications for our 2018 training. We are seeking individuals looking to increase community knowledge in home food preservation methods. Applicants for the UC Master Food Preserver Program must be willing to share knowledge and skills learned from certification training through local community outreach. Prior food preservation knowledge is not a requirement; willingness to teach others is. 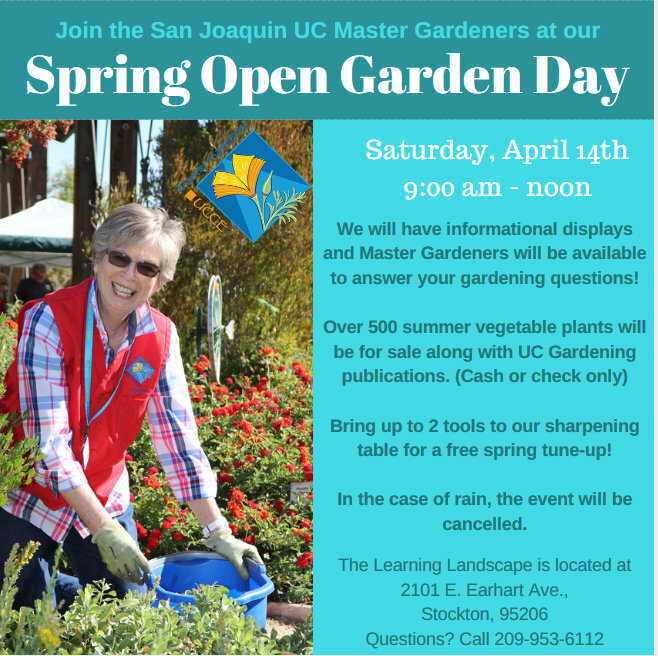 The Master Food Preservers are excited to have a table at the Master Gardener Spring Open Garden Day on Saturday, April 14 from 9 am - noon. The Master Gardeners will have over 500 vegetable plants for sale along with UC gardening publications that would be a great addition to your gardening library (cash or check only please). There will be information tables on various gardening topics and light refreshments will be provided. You can even bring down 2 gardening tools and drop them off at the tool sharpening table for a quick spring tune-up. We hope you will come out to have your food preservation and gardening questions answered. Please note, if it is raining the event will be canceled. If you have any questions, please call 209-953-6112. We are excited to announce that registration for our April Master Food Preserver workshops is now open. Space is limited, so register today to reserve your seat. 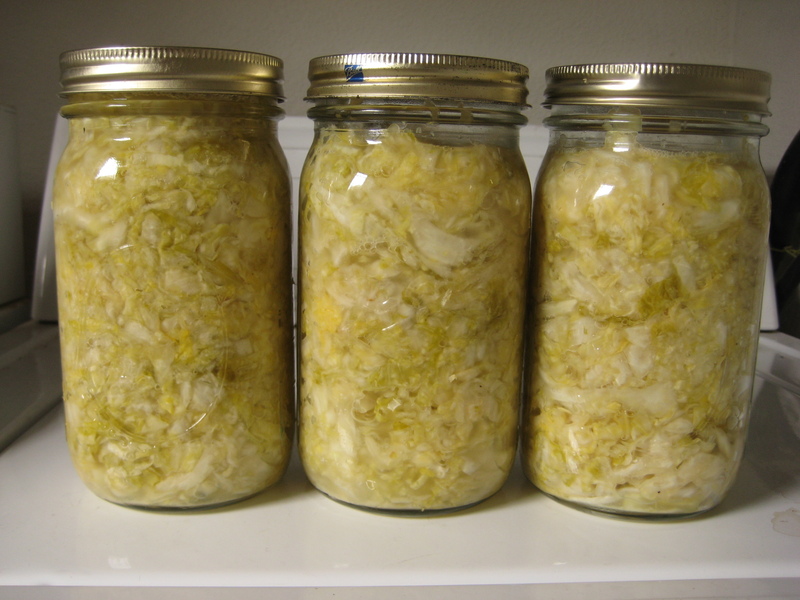 Pressure Canning opens the door to more complete food preservation. Vegetables must be preserved with pressure canning. Soups stews broth fish and meats all need pressure canning. This workshop will help expand your knowledge and comfort of pressure canning. You will make and take home some pressure canned products. There are only 7 spots left for this Saturday's workshop on infused oil & vinegar. Sign up today and learn how you can make some unique holiday gifts this year! 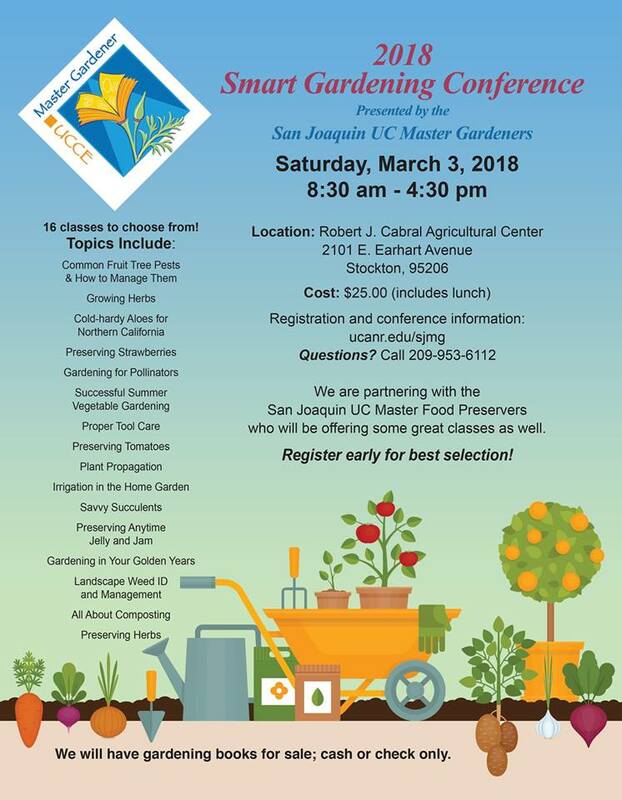 We are excited to announce that we will be joining the UC San Joaquin Master Gardeners at their 2018 Smart Gardening Conference on Saturday, March 3. We will be offering 4 different classes throughout the day. Class sizes are limited so don't wait to register! The cost is only $25.00. * Light morning refreshments and lunch is included in your registration. Registration opens at 8:30 and the keynote begins at 9:00 am. Come spend the day with us learning how you can preserve things commonly grown in the garden! If you have any questions, please call 209-953-6112. *Please note, the hands-on Master Food Preserver class does have an additional $10.00 materials fee due at the beginning of class. It is lemon season. If you have a tree it is loaded with fruit and even if you don’t have a tree yourself suddenly bags and boxes of lemons are appearing everywhere you go. Come to our January workshop and learn how to store your lemons and how to preserve some of the lemony goodness for later use. 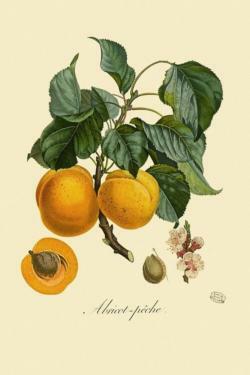 We will be making a Lemon Ginger Marmalade and a wonderful Lemon Curd to keep in your freezer. November workshop - Go Nuts! There are still spots available for this weekends class! Sign up today! Want to go nuts? Come join us! The UC San Joaquin Master Food Preservers will be making delectable nut butters. 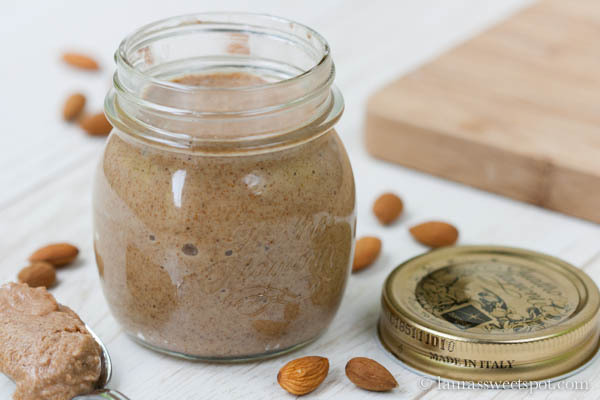 We will show you how to make an array of your own fancy nut butters that are nutritional and packed with delicious flavors. They will make great holiday gifts! This will be a demo class. We will be making nut butters, talking about freezing to preserve them and in the end we will be sampling them! There is still room, sign up ASAP for this Saturdays class! Let us take the mystery out of making edible olives! Join the UCCE Master Food Preservers of San Joaquin for a morning of instruction, Q & A, and some live demonstrations of different olive curing techniques. 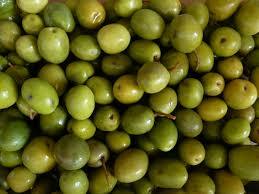 Also learn how to safely and effectively use lye to cure your olives. Please register at the link below, space is limited. Happy Fall! The weather is cool and it is a great time to be preserving the fall harvest! We hope you enjoy this issue of Preservation Notes. Feel free to share it with your friends and family, or better yet, encourage them to sign up fr our newsletter so they don't miss out on upcoming issues and class announcements! Happy preserving! MFP September Class - Pie Filling! It is September and the fresh, crisp apples are calling us. Apple pie is a standard for Thanksgiving, Christmas and Holiday dinners, which can be some of our busiest times. How wonderful it would be to make pies in a flash. Come to the Apple Pie in a Jar class and learn how to preserve the filling in a jar, ready to be placed in a crust and baked. You will go home with a jar to make a pie and try it out. Come join us Saturday September 16 from 10 am to 2 pm. Registration begins at 9:30, class begins at 10 am sharp. Are you trying to figure out what to do when your tomato plants really start producing? Join us for our August monthly workshop and learn how to preserve the rich bounty of summer sun, for the cold dark winter. You will learn how to preserve fresh tomatoes, and a flavorful salsa, in a boiling water bath canner and take home 2 jars to enjoy! Space is limited, sign up today! 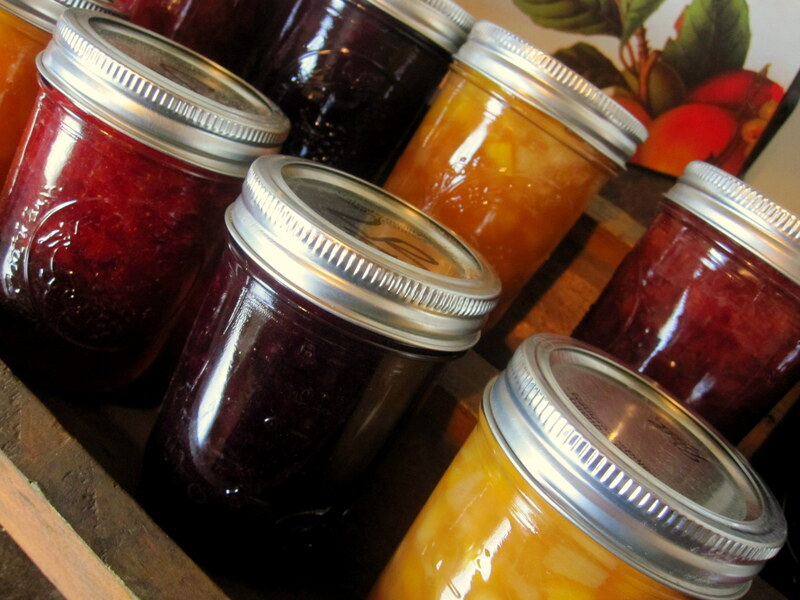 Summer is here and its the perfect time to do some preserving! We hope you enjoy this edition of Preservation Notes! What does it mean … bring to a boil? May workshop (Jams & Jellies) and Training Application Extension! We apologize if you tried to register for the Jams n' Jellies workshop and received a message that the class is full. There is still room and the glitch has been fixed. 2017 Training Application Deadline - May 19th! Did you miss the deadline to apply for the Master Food Preserver Training beginning this June? You're in luck! The application deadline has been extended until 5:00 pm on Friday May 19th. Find more info on our website, click here. Saturday, May 20th 10 am - 2 pm. We are fortunate to be surrounded by a bounty of fresh summer fruits. 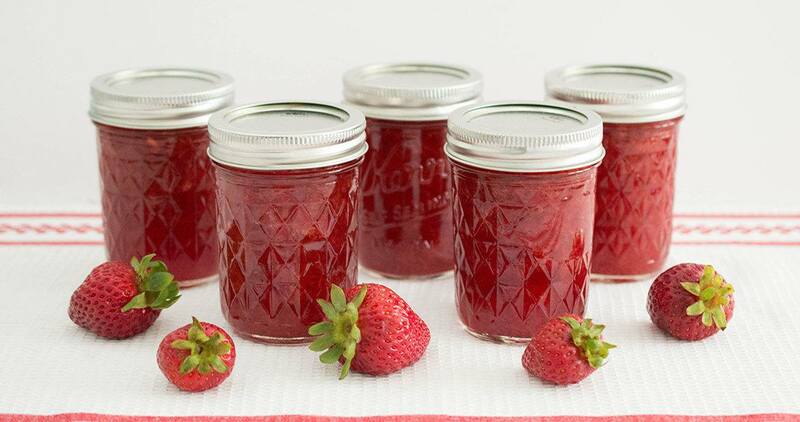 Making jams and jellies is a great way to preserve them! Join us for our May workshop and learn how you can enjoy your favorite fruit all year long. 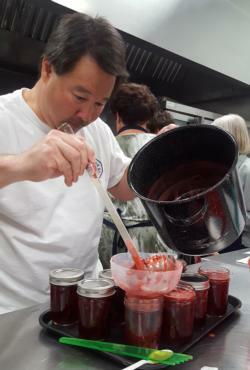 Take home strawberry jam and cherry jelly after this hands-on workshop. Registration Deadline is May 15, 2016 Space is limited! Ever want to know how to make your own fabulous jellies, jams and fruit preserves? 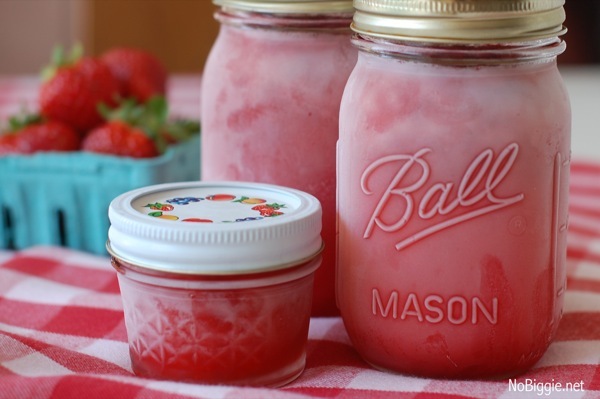 You walk through the Farmers' Markets or drive by the strawberry stand in your community and want to know how to preserve those sweet, red berries? Do you just crave a fresh peach preserve? Well join us on April 22nd in Modesto and Stockton AND on April 28 in Ripon for a “Basics in Water Bath Canning”. 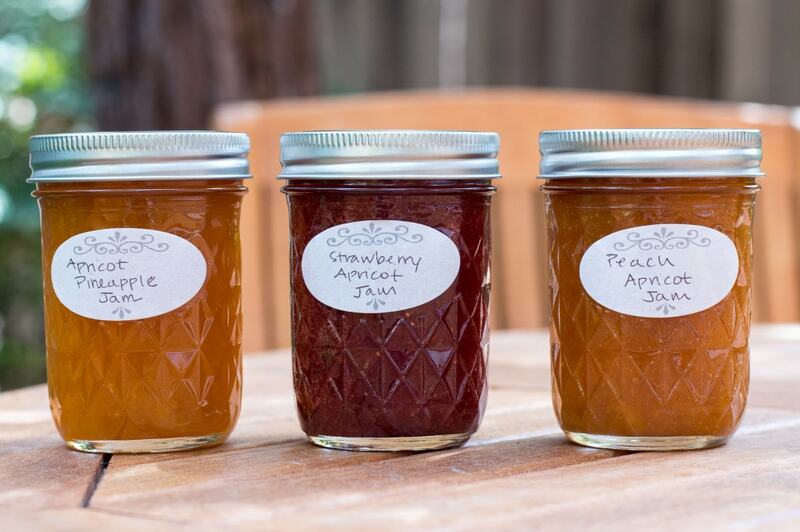 This 90 minute demonstration will walk you through what you need to know to get started at home making your own jams, jellies and fruit preserves safely. To register for one of these free workshops, click here. The cost for these demonstrations is FREE. Each demonstration workshop will have the same content but different presenters. Please choose the workshop of your choice. We look forward to seeing you at our demonstration workshops in April. The weekend is here and so is our newsletter, Preservation Notes! We hope that you find the information inside useful and inspiring! This is something our program is planning on having available on a quarterly basis. Please feel free to share with your friends and family if you think they will benefit from the information inside. To view the newsletter, click on the link at the bottom of this email. Do you want to learn more about food preservation and food safety? Are you looking for a way to get involved n your community? Have you been thinking about joining the UC Master Food Preserver (MFP) Program? Now is the time to get your application in! We are in the final planning stages for out next MFP training that will begin in early June. This is a mandatory orientation meeting is required attendance. If you can not attend either of these meetings please call or email our office to make other arrangements. For more info on the 2017 MFP training, click here. Space is limited for this training. Drying fruits, vegetable and meats is one of the oldest methods of food preservation. With a dehydrator there isn’t really anything you can’t preserve through drying. Unlike some recipes where you can’t control sugar content, dehydrating gives you room to experiment and preserve food with low sugar, low salt and high flavor. Come spend the morning with us and learn the various methods of dehydration. Learn how to use food you have preserved. We will also discuss creating dehydrated meals for use in backpacking and emergency preparedness. Sometimes it’s just TOO hot in the kitchen to preserve one more jar. What’s the alternative? Freezer Jams! Does the word curd at the end of anything make your stomach turn? 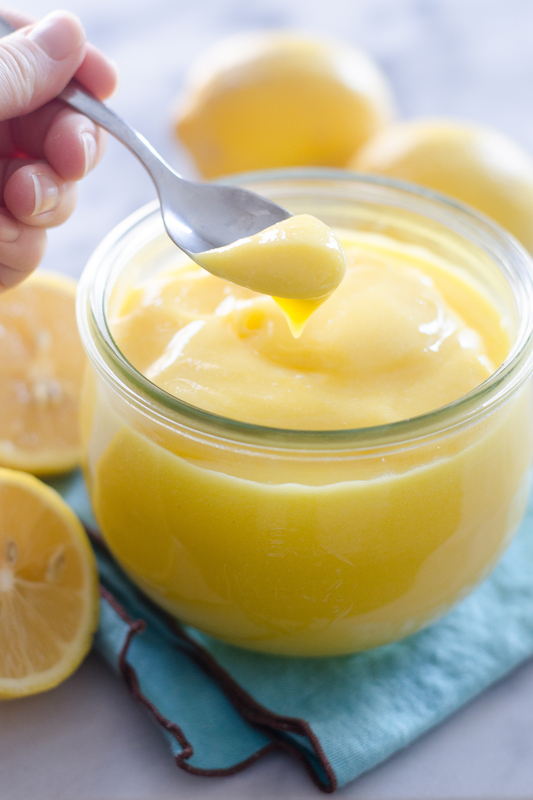 Then you have not tried Lemon Curd! One of the most delicious toppings for scones, or just eaten right from the jar! Don’t miss this opportunity to make Jam and Lemon Curd. Your taste buds will LOVE you! Items to bring: Bring your own lunch. 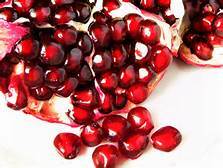 POMEGRANATES... the fruit of Greek mythology, the main ingredient for Grenadine syrup, a wonderful addition to salads and soups and a fabulous tasting juice that can be a great jelly... can you say holiday gift?! Price: $10.00 - Class size limited, don't miss out! 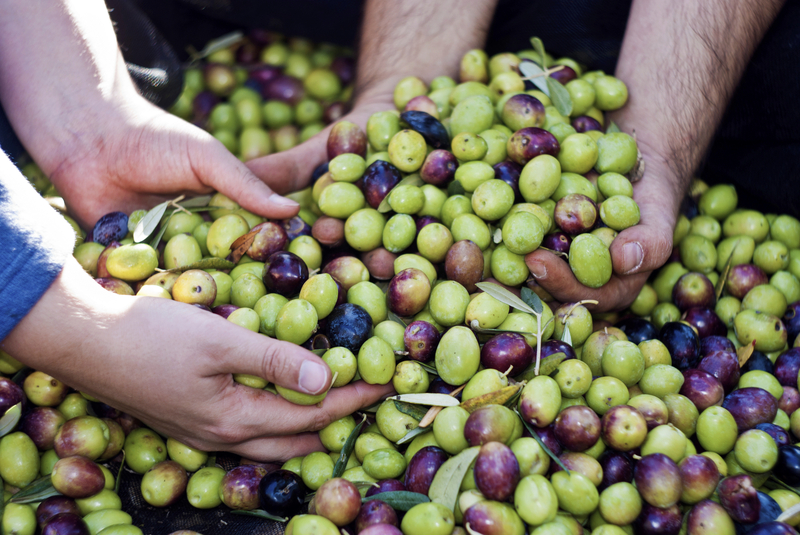 Learn to cure delicious olives according to the Mediterranean tradition. We will explore three different curing methods, utilizing both salt curing and lye curing processes. Appropriate for all skill levels. When you hear "pickles," what do you imagine? Probably those classic, crunchy dill pickles we all know and love. But there's so much more to the colorful world of pickling! Have an abundance of garden vegetables? Pickling your veggies help you enjoy your home-grown products throughout the year. Third time's the charm! The workshop will be held on August 27th and the registration deadline is August 22. Sorry for all of the confusion! Trying to save money by preserving seasonal produce and herbs? Want convenient and healthy snacks for your family? Packing for a hike or road trip? Planning ahead for homemade holiday gift ideas? Want to be prepared for an emergency situation? 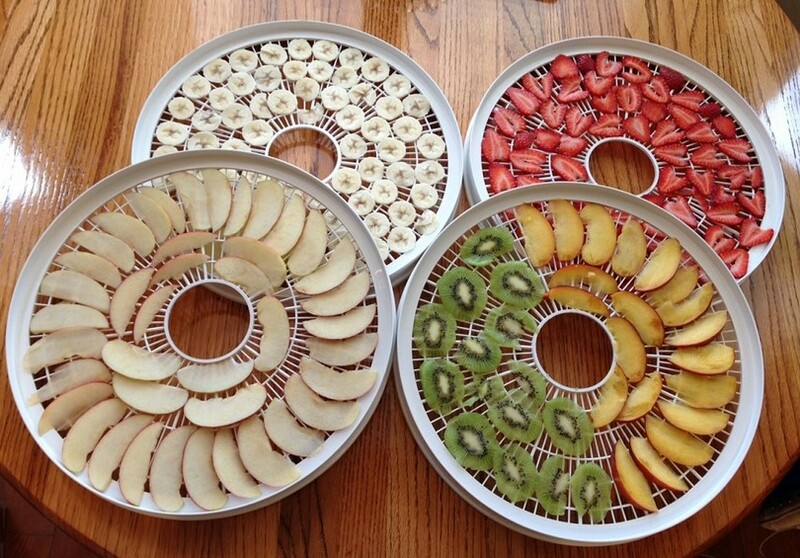 Having a dehydrator, and using it, can give you the opportunity to preserve fresh fruits and vegetables for use in the off season. Come join us for a demonstration on how to dehydrate. Check in begins at 9:30 am. This is a demo only class. Join the UCCE Northern San Joaquin Master Food Preservers as we celebrate one of the summer harvest’s best gifts – the tomato. Long ago tomatoes were called “apples of gold” and had been cultivated by the Aztec since 500 B.C. They love the heat in our Central Valley gardens. Learn to preserve their fragrance and flavor all year long by using safe, modern techniques. Check in begins at 9:30 am. This is a hands-on class. You will be on your feet much of the time (though accommodations may be made with prior notice), so please wear comfortable, closed-toed shoes. Price: $25.00 Includes two jars of tomato goodness to take home. Mediterranean Chutney & Fresh Summer Jam! Join the UC Northern San Joaquin Master Food Preservers as we celebrate one of the Summer Harvest’s best gifts – the apricot. Once called “the seed of the sun” by the ancients, apricots lend themselves perfectly to Central Valley orchards, but for a short season. Learn to preserve their beauty, fragrance and flavor all year long by using safe, modern techniques which will include two recipes for you to take home! Check in begins at 9:30 am, class will begin promptly at 10:00 am and will end at 2:00 pm. This is a hands-on class. You will be on your feet much of the time (though accommodations may be made with prior notice), so please wear comfortable, closed-toed shoes. Appetizing Apricots: Mediterranean Chutney & Fresh Summer Jam! Join the Master Food Preservers of the Northern San Joaquin Valley as we celebrate one of the Summer Harvest’s best gifts – the apricot. Once called “the seed of the sun” by the ancients, apricots lend themselves perfectly to Central Valley orchards, but for a short season. Learn to preserve their beauty, fragrance and flavor all year long by using safe, modern techniques which will include two recipes for you to take home! A few upcoming classes to watch for! 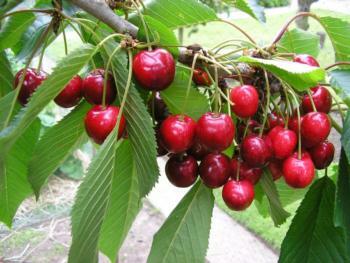 Cherries Jubilee - Learn how and what to do with one of the valley's fruit jewel. We will make a few items to take home and explore several other methods of preserving cherries. 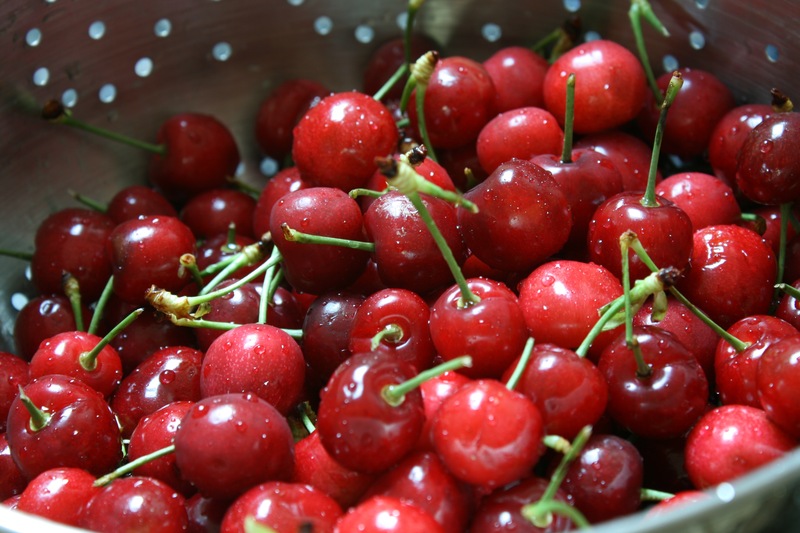 Let's celebrate San Joaquin valley cherries! 10:00 am and will end at 2:00 pm. Registration Deadline is May 13, 2016. If you need assistance or accommodations, please contact the UCCE Master Food Preservers of San Joaquin at 209-953-6100. 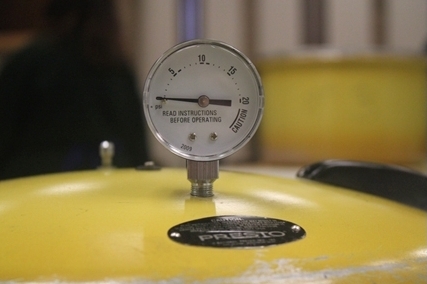 Learn how to safely pressure can, test your gauge, and pressure can meats and vegetables. This is a hands-on canning class. You will be on your feet much of the time (though accommodations may be made with prior notice), so please wear comfortable, closed-toed shoes. Learn modern, research-base techniques for safely preparing ancient fermented recipes! 2:00 pm and will end at 6:00 pm. Join us for this informative discussion and preparation of modern safety and ancient recipes. You will take home recipes, new skills / techniques and your own jars to watch the process in action as it ferments on your own kitchen counter. Class will conclude with a meal around the table for you to enjoy your new recipes and new friends! 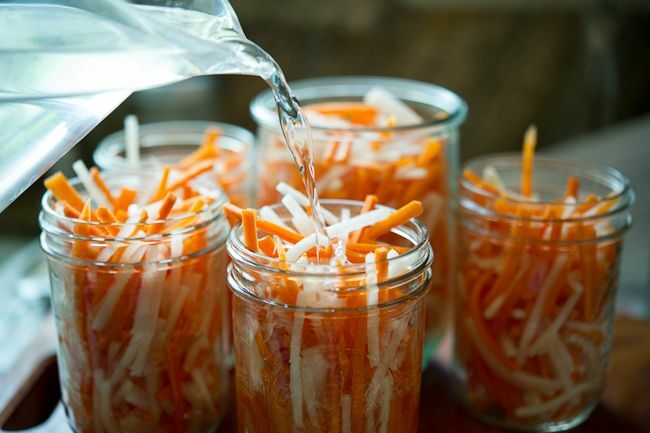 This class is an immersive, hands-on fermenting class. You will be on your feet much of the time (though accommodations may be made with prior notice), so please wear comfortable, closed-toed shoes. 2016 Master Food Preserver Training! Become a UC Master Food Preserver! Contribute to your community. Every year UCCE Master Food Preservers contribute several thousand hours of volunteer service helping keep our community safe and healthy. Enjoy working together with a great group of food enthusiasts. What do MFP Volunteers do? Answer food preservation telephone and email inquiries. Staff information booths and present food preservation demonstrations at the local farmers' markets and other local events. Write articles for local newspapers and the MFP eNewsletter or blog. Want to learn how you can make unique holiday gifts? Cost: This hands-on class and fundraiser is only $60.00 and includes lunch. It's time to register for the 2015 Smart Gardening Conference. Master Food Preservers will have their own track of classes this year. Don't Miss Out! This is a bi-annual event. Classes are filling up! We are excited to have Janet Sluis, Horticulturalist/ Curator, Sunset Western Garden Collection as our keynote speaker. Light refreshments will be provided beginning at 8:00. Registration begins at 8:30. Spaces are limited so sign up now to get the classes you want. Tomatoes!! August Master Food Preserver Workshop. Space is filling up! Only a few seats left! Don't miss out! Visit our website! Click here. For more information call 209-953-6100. Join the UCCE Northern San Joaquin Master Food Preservers and come and learn how to pickle... not just cucumbers!